Been thinking about my mom a lot lately. Today, 9/10, would have been her birthday. I guess it's normal that these milestones bring to mind ghosts from the past to haunt us and make us reflect on relationships. She had a hard time accepting a gay son & an even harder time when I met a man with whom I wanted to spend my life. She grew to accept him, but I'm not sure it was much more than acceptance. Acceptance; hell, her mere acceptance applies to both of us during the first 15 years with Hubby. But that began to change when I stayed with her in the hospital during her last few weeks. I think she grew a little fonder of Hubby during that time. He came to her bedside several times a day and always brightened the room. He'd flirt with her and joke around always bringing a smile to her face. I think she saw how much I depended on him to be my rock as she depended on my sister and me to be hers. I don't know where I'm going with this. It's just ramblings but somehow it helps to exorcise this spirit. I miss her. Eleven years after her passing and I miss her still. Linc Rabbit loves craisins. He's learned the sound of the bag opening and goes running for his treat every time he hears it. He watched his human go to pantry and grab the bag from a lower shelf. He knew that he could easily reach that shelf. One short hop and the craisin bag would be his. He'd already mastered plastic bags. 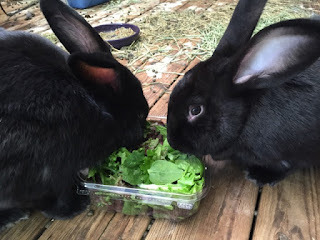 A few quick bites with his razor sharp front teeth tore a big hole in the bunny pellet bag. The craisin bag would be similar. But the human never left that door open long. Try as he might, he couldn't figure out doors. 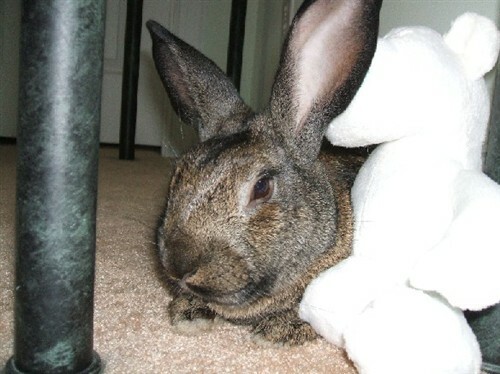 Linc is my male Flemish Giant rabbit & he's super affectionate. 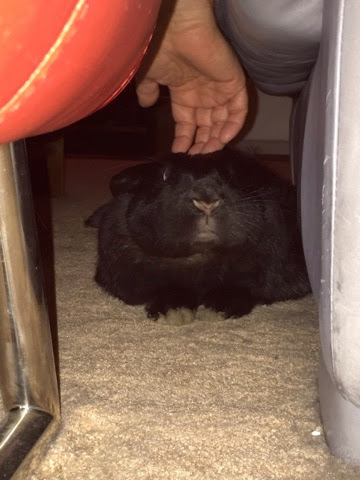 He loves to be rubbed & to snuggle with me if I get on the floor with him. We have a female but she doesn't like to cuddle as much as Linc. I was in JC Penny, but it wasn't a store. It was a gym. I paid $1500 to work out there for the day. I went to a lat pull machine and when I started using it, it fell apart. Then 2 managers came over, both blonde and fat, both with a whole cherry pie in right hand and cigarette in left. They told me I had to leave. They alternated between taking a bite of the pie, followed by a drag on the cigarette. Each time they took a bite of pie, large wet chunks would fall to the floor. I protested, saying "But I paid $1500 to work out and the machine just fell apart." They escorted me to the door, all the while eating and smoking. I know that I shouldn't get emotional about a restaurant closing, but today I feel really sad and a little hurt. A place where we've been going for breakfast, almost every morning for the last 16 years shuttered its doors for good. Early this morning, we went and the staff was pulling equipment out of the building and putting it on a truck. I feel like I was lied to. The manager could have come to us yesterday & said “don’t tell anyone, but we’re closing.” That would have been simple and we wouldn't have said anything. But instead, he was promoting a new addition to the menu, a menu that he’ll never implement, that will come out on Wednesday. I have to admit that it will affect Hubby much more than me. I leave for work while he sits there for another hour talking to friends. He’s heartbroken; was in tears this morning. He was wondering where all his friends will end up going. He’d like to join them. I know. Times change and life will go on. We’ll find a new place. But for now, we’re sad.